REAL SCIENCE THAT’S FUN FOR ALL AGES! Join a small team of your friends, family, and other interesting volunteers. 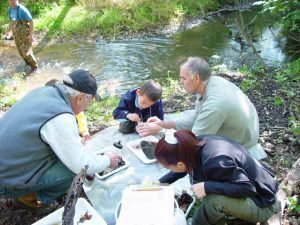 Collect samples of bugs and other creatures that live in our streams. These insects tell us how healthy the river system is, where the healthier areas are, and where we need to focus our restoration efforts. Volunteers meet in Ann Arbor* and then trained volunteer leaders take you to two stream sites. At these sites, you help search through stones, leaves, and sediment to find the insects in their homes. Only trained volunteers go in the water. Dress to be in the field for a couple hours. You must register early to be assigned to a team. Children are welcome to attend with an adult. WHERE: Meet at the HRWC office* in Ann Arbor (1100 N Main Street). Then car pool to two streams in Livingston, Oakland, Wayne and/or Washtenaw Counties. PHOTOS and STORY: Get a sense of what this event is like from a HRWC volunteer here. 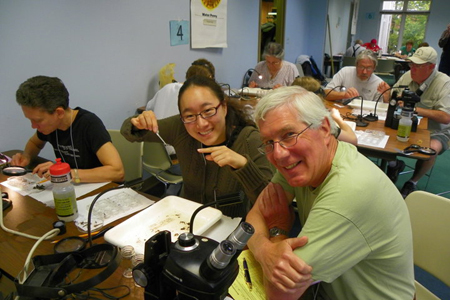 Get to know aquatic insects on a first name basis! Identifying insects from the water ways can help us figure out what the water quality is within different sections of the Huron River Watershed. WHERE: At the HRWC offices in the NEW Center, 1100 N. Main Street, Ann Arbor. DEADLINE: Please register by April 25, 2018.